Google Confirms Android Media Event -- Hello, Nexus One? The Google Phone is coming! The Google Phone is coming! With the way the blogosphere is deifying this thing, you'd think we were talking about the freakin' Jesus reader again. The so-called "Google Phone," as you've probably heard, is an Android-powered device believed to be on the way from Google. Unlike other Google phones (note the lack of capitalization on the second word there), this one is said to be designed, branded, and sold directly by Google itself. Oh yeah -- and it's going to forever alter the world of mobile communications. Before you toss your current cell phone into the trash, though, there are a few things you may want to consider. The Nexus One "Google Phone"
Said to be codenamed "Nexus One," the almighty Google Phone has truly taken on a life of its own. Blog reports have predicted the phone will be an HTC-produced unlocked device, not tied to any specific carrier. It will run on Android 2.1, the chatter suggests, and will go on sale in early January. Some of the other allegedly leaked details about the device: The Nexus One will look like the HTC Passion, be thinner than the iPhone, and feature a high-res OLED touchscreen. It will have an on-screen keyboard, two mics, and a Snagdragon chip. It may even have high-tech pheromone-sensors to help you get lucky (though I'm pretty sure that last one was a satirical suggestion). Impressive? Definitely; if and when this phone is released to the public, the Nexus One could be a very cool Android device. But the growing wave of sensational stories is portraying it as so much more -- and, despite what some of the headlines claim, the material is based primarily on chatter, not confirmed fact. Google's official Mobile Blog, contrary to what some headlines have claimed, has not confirmed the existence of the "Google Phone" -- at least, not the handset we've come to envision over the past couple of days. Google's blog posting simply stated that the company's employees were given a device for testing purposes. A Google exec described the device as a "mobile lab," saying it "combines innovative hardware from a partner with software that runs on Android to experiment with new mobile features and capabilities." That's all. Much of the salivation has been attributed to a series of tweets apparently sent by Google employees. The tweets refer to the phone as the "new Google phone" and tout its impressive features. The term "Google phone" has long been used as a descriptor of Android-powered devices in general; the phrase in and of itself does not necessarily mean the phone is some magical new kind of device. Could it be? Absolutely. But it could just as easily be a regular next-gen Android handset that's undergoing some internal testing. The whole notion of the device being "unlocked" may or may not mean much. First of all, the Nexus One is said to be a GSM device, meaning it'd work only on T-Mobile and AT&T within the U.S. Second, the FCC testing report for the device, initially spotted by Engadget, shows that the HTC-built Nexus One has been tested only for the 3G bands supported by T-Mobile's network. As far as the U.S. goes, that sure seems to point to this device being T-Mobile-centric. Even if the phone were fully unlocked and available to use on any network, that fact alone isn't as groundbreaking as some have suggested. Google has offered two different unlocked phones in the U.S. before: the Android Dev Phone 1 and the Google Ion. Other manufacturers have sold unlocked handsets as well. Without the subsidization provided by a carrier's contract-based deal, unlocked phones are typically too expensive to ever take off. Given the echo chamber of the online news cycle, it's easy for the line between chat and fact to become blurred -- particularly when we're talking about such exciting technology. 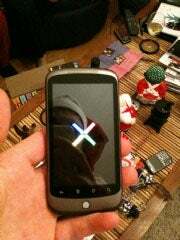 But the truth is that we don't know much for certain about what's in store for this Nexus One device just yet. Until the specifics are actually confirmed, take the factual-sounding headlines with a grain of salt. A healthy dose of skepticism can never hurt; automatically accepting every shred of "leaked info," on the other hand, certainly can. JR Raphael frequently covers mobile technology for both PC World and eSarcasm, his geek-humor getaway. You can keep up with him on Twitter: @jr_raphael.